The new MegaChat only supports voice and video calling for now, but text chat and video conferencing will be added soon, Mega founder Kim Dotcom said on Twitter. The service runs inside Web browsers, not through a dedicated application, and is free to use. It can be launched from the mega.nz (not mega.co.nz) website by clicking on the new "Conversations" button in the left-side toolbar after logging in. One of the most important features of the service is that, according to the company, it uses end-to-end encryption. This means that Mega shouldn't have access to users' encryption keys and shouldn't be able to decrypt communications. "No US based online service provider can be trusted with your data," Dotcom said in December when he revealed plans to launch the service. "They must provide the US Government with backdoors," he claimed at the time positioning MegaChat as a Skype alternative. Of course, Dotcom is no friend to the U.S. government, which has been trying to extradite him from New Zealand to face copyright infringement and other charges in connection to the activity of his former company, Megaupload. Also, end-to-end encryption only protects communications from upstream surveillance if there are no errors or intentional backdoors in the implementation, so until security researchers and cryptography experts have a chance to look at Mega's implementation it would probably be best not to use the service for highly sensitive communications. The service is currently in the testing phase anyway, so the existence of bugs wouldn't be unusual. "Mega offers a security bounty again," Dotcom announced Thursday on Twitter. "Please report any security flaw to us. We'll fix it and reward you. Thanks for helping." 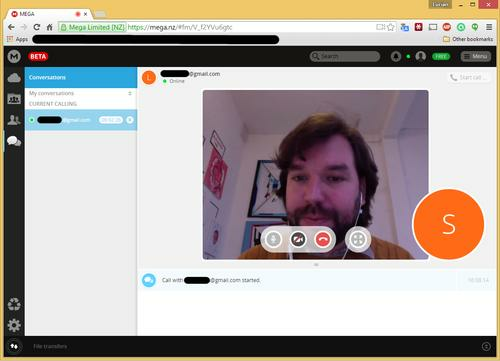 A video calling test with MegaChat went relatively smooth. There were brief moments of video and audio degradation (mostly video), but not worse than typically experienced with Skype on the same machine and with the same Internet connection.